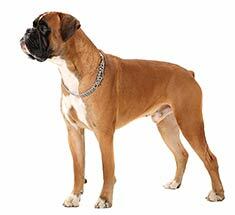 Boxers are medium sized and square built dogs. They are strong and thickly muscled, with a short coat and a docked tail. Boxers are described as people dogs because they do well with children and other family pets. The Boxer originated in Germany during the 19th century. Male Boxers range from 22.5 to 25 inches. Female Boxers range from 21 to 23.5 inches. Male Boxers range from 65 to 80 pounds. Female Boxers range from 50 to 65 pounds. 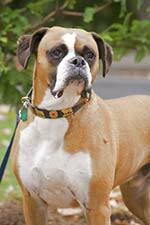 Boxer colors are fawn and brindle with white markings. Boxers have short and smooth coats that lie close to the body. Their coat requires only an occasional brushing. The Boxer is an energetic, attentive and devoted dog breed who is gentle and patient with children. They behave well with other household pets, but are cautious with strange pets and people which make them good potential guard dogs. 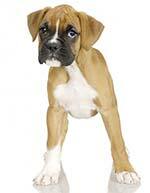 The Boxer is susceptible to hip dysplasia, cancer (in older dogs), allergies and heart problems. The expected life span of the Boxer is 8-10 years. Boxers are full of energy and are perfect companions for active families. Boxers require mental and physical exertion and are not recommended for people who are easy going and slow-moving. Boxers are both sensitive to hot and cold weather and do best when allowed to divide their time between the house and the yard. The Boxer is in the working group. Boxers are square-framed, muscular dogs of medium size. They are known for their toned muscles and their sleek short coats. Boxers’ penetrating stare and broad muzzles give them an appearance of constant alertness. The standard breed of Boxers recognizes two distinct colorings: fawn and brindle. Fawn coloration ranges from a light tawny to a dark, almost reddish brown. Brindle coloring is marked by black stripes. These stripe patterns vary and cover a spectrum spanning a few well-defined slashes to an almost reversal in coloring in which the stripes dominant the fawn background. Although originally bred for hunting and work, Boxers have always been known for their obedience. While this is still true, Boxers also make great family pets because they are extremely playful and energetic. They even have a repertoire of unique characteristics and mannerisms that have brought them love throughout dog communities. One of these is a common excited dance often described as “kidney beaning,” in which Boxers will maneuver its head to its hindquarters forming a semi-circle (and resembling a kidney bean) and then spin around in a circle. Another distinct trait is the sound Boxers make when wound up or eager. The noise is like an adorably pathetic choo-choo train and sounds something like “woo woo,” somewhere between a bark, a whine, and a squeal. Intelligence is another common Boxer characteristic. This can be both a positive and a negative aspect when it comes to training. Boxers will learn very quickly and retain information well. Their liveliness translates into to an eagerness to learn and please. However, their smarts and playfulness can also be hindrance to training. Boxers can be stubborn. Sometimes, knowing exactly what is expected of them, they will disobey commands. This can turn into a game for them if it is not dealt with patiently and firmly. 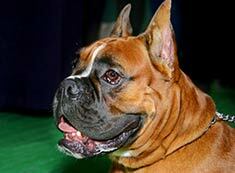 Boxers were first bred in Germany and originate from the Brabanter Bullenbeisser of Belgium. Boxers were working dogs from the start. German elites chose Boxers for hunting because of their strength, intelligence, and agility. As was popular at the turn of the nineteenth century, Boxers were used to hunt wild boars because their jaws were ideal for holding large game. Their ears were cropped to prevent injury on these dangerous escapades. Boxers, known for their obedience as well as their power and dexterity, were excellent work dogs. In the 1800’s they became popular dogs for cattle dealers. The modern Boxer is the result of an 1830 cross breeding between Brabanter Bullenbeissers and an early form of the English Bulldog. The original breed was white in color. However, these Boxers did not gain much recognition until the start of the German Boxer Klub in the 1860s. The English name, Boxer, is thought to originate from the dogs’ instinctual use of its front paws during play and fighting. In 1895, a standardized conception of what the Boxer breed should look like was established. As with the original progeny, these Boxers were white and pictures from this time period corroborate. By 1925, however, this standard was changed and white was no longer accepted as the typical color for the breed. It has been theorized that this change was concomitant with Boxers’ use as police dogs, where darker coloring was essential for work at night. Find Boxer Puppies with our Free Breeder search!